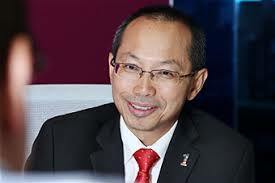 The name Abdul Wahid Omar first appeared on my radar when I was a journalist with the Business Times, shortly before he went to Telekom Malaysia as its chief executive. Before long, he had taken over the helm of Maybank, the country's biggest commercial bank, and just as quickly, it would seem, he accepted the call of the Dewan Negara to be Senator and a Minister in PM Najib Razak's Cabinet. Some of us assumed power would eventually get to this man's head and that he would soon eat his own words about being a one-term Cabinet Minister. But AWO was true to his words. And before we knew it, he's completed a sterling first year as Chairman of PNB, Malaysia's biggest and most important fund management company. 1. Today 1 August 2017 marks my first complete year as Group Chairman of Permodalan Berhad (PNB). Let me begin by expressing my gratitude to YAB Prime Minister & the Government for entrusting me to lead PNB. I must say Dato' Abdul Rahman Ahmad (DARA) and I have been fortunate to have received the baton from Tun Ahmad Sarji and Tan Sri Hamad Kama Piah a very solid national institution of integrity in PNB. We are grateful for the support from our people in PNB from day one which enabled us to 'get cracking' immediately. i. Smooth leadership succession at Chairman, CEO and board levels. Recruited DARA as CEO on 1 October 2016. Effected board succession on 1 January 2017 and streamlined management structure at group level. ii. Announced PNB Strategic Plan 2017-2022 "STRIVE 15" on 26 November 2016 aimed at building PNB into a Distinctive World Class Investment House. Adopted a more open and engaging approach. Focus on immediate execution of the 15 initiatives under the Strategic Plan. - Sime Darby Demerger to create 3 'pure plays' of Plantations, Property and Multinational Distribution & Logistics. On track for listing by mid December 2017. - UMW Holdings demerger and recapitalisation of UMW Oil & Gas. Demerger completed July 2017. Recapitalisation in progress. - Acquisition of SILK Highway to enhance PNB's Prolintas toll road concession portfolio in preparation for IPO in 2019. Acquisition completed June 2017. - Merger of SP Setia and I&P Group to create one of the largest and most profitable property development groups in Malaysia. Expected completion November 2017.
iv. Intensified efforts towards greater Shariah compliance resulting in Jabatan Mufti Selangor issuing 'Harus' fatwa or permissible edict for ASNB products in April 2017 in line with the National Fatwa edict in 2008. Only Penang is pending review. v. Successfully migrated to a new IT system on 28 June 2017 to enable ''passbook-less'' transactions to be undertaken. Online transactions currently under beta / trial at www.myasnb.com.my will also be officially enabled from 1 September 2017. 3. Alhamdulillah, market reaction has been positive with total market capitalisation of the six PNB strategic companies increasing by RM40 billion YoY since 1 August 2016 or RM29 billion YTD in the first 7 months of 2017. This represents an increase of 28.2% YoY or 18.9% YTD, higher than the increase in KLCI of 6.5% and 7.2% respectively. Another positive development is that Maybank's market capitalisation has also breached the RM100 billion mark in June 2017, a major milestone in Malaysia's capital market history. 4. We are grateful to Allah SWT for His blessings. None of the progress made would have been possible without the solid support and assistance from our Board members, management and staff of PNB, ASNB and our group companies. Thank you. Special mention to the Board members and management of our strategic companies in particular Sime Darby, UMW Holdings, UMW O&G, SP Setia, I&P Group and Prolintas for driving and supporting the value creation initiatives announced thus far. 5. Whilst we have made good progress at PNB, we still have a lot to do towards achieving our aspiration. As we move down the list of our strategic companies for value enhancing activities, we will also start engaging with our core companies (where we have at least 10% shareholding) with a view to improving their total shareholder returns (TSR). We also plan to work closely with other institutional investors for greater shareholder activism aimed at enhancing corporate governance and performance of public listed companies. 6. After one year at PNB and with the management team led by DARA fully in place, I plan to also allocate some time to support some of our strategic companies in their transformation or performance improvement. Four days ago on 28 July 2017, the Board of Sime Darby Berhad announced, among others, my appointment as the Chairman of Sime Darby Property Berhad (SDP). SDP will be a separately listed entity upon completion of the Sime Darby demerger exercise. With total land bank of 18,000 acres in prime location such as City of Elmina, Bandar Bukit Raja, Serenia City, Alya KL and Malaysian Vision Valley, SDP can be regarded as having the 'dream land bank' of many property developers. I pledge to take on this additional responsibility to the best of my ability for the benefit of SD Property, its shareholders, PNB and the 13 million unit holders. 7. I thank you for all your help, support and guidance and I look forward to your continued support to me, ARA and PNB group companies. Let us all be constructive and play our respective part for an inclusive, sustainable, equitable and prosperous Negaraku Malaysia. Thank you and with best regards. Good guy. More will come. I just hope that's the English translation of AWO's message as PNB Chairman in Bahasa Malaysia. And since the title of your post is PNB1, may I ask a question? Have PNB bought 25 new vehicles for that 25 PNB number series they tendered for RM419,006? "3. Alhamdulillah, market reaction has been positive with total market capitalisation of the six PNB strategic companies increasing by RM40 billion YoY since 1 August 2016 or RM29 billion YTD in the first 7 months of 2017. This represents an increase of 28.2% YoY or 18.9% YTD, higher than the increase in KLCI of 6.5% and 7.2%"
... I'll be waiting with bated breath for the announcement, this year-end, for the ASB and Pak Lah's ASG (Amanah Saham Gemilang) dividen, since 2016's had been the lowest ever. The headline was actually inspired by the brouhaha over AWO's decision to purchase those registration numbers. Personally, I don't see what the ruckus was all about. If PNB had gotten those numbers without tender, it would have been a juicier story. I hope ASB continues to do well. Same with ASG. The Amanah series has given healthy dividends to unit trust holders for decades. And come what may, people expect them to always perform above par. At times, unfairly. But that's how much faith they have in PNB, I suppose.